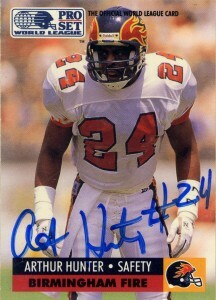 Signed as a free agent by the Seattle Seahawks in 1990, Arthur Hunter didn’t make the final roster. Undeterred from playing football, he would be drafted by the Birmingham Fire of the WLAF in the 10th round of the league’s initial positional draft. Art ended up leading the secondary with his aggressive play, pulling down 6 interceptions and a touchdown. The team finished second in the league in interceptions. Despite even chocking in 61 tackles and two fumbles, he was not selected to the league’s All World Team. In 1992, he’d add another 2 picks and a touchdown to bring his career total to 8 before the league would suspend operations and reorganize following the season. In both seasons, Hunter was an unheralded member of the Birmingham Fire’s staunch defense that formed the backbone of the playoff bound teams. When I found Arthur, he and the other defensive backs were leaving through the stands after the game. They all patiently stopped and signed my cards and laughed at their photos on the back. Since then Hunter played some time in the Arena Football, but the information and his current whereabouts range from very sketchy to unknown.